40 Cannot continue the operation. There is another install operation in progress. By adding the following code below to your website you will be able to add an install button for Kotlin Plugin for Eclipse. org.eclipse.core.runtime.CoreException: Plug-in org.jetbrains.kotlin.ui was unable to load class org.jetbrains.kotlin.ui.editors.KotlinFileEditor. I tried this on a kotin project created from the "New" wizard and also on new maven project to which I added the kotlin nature. See issue KE-295 in JetBrains Bug & Issue Tracker (YouTrack). When I import the mixed-java-kotlin-hello-world (from JetBrains kotlin-examples on Github) into Eclipse the HelloWorld Java class cannot find the KotlinGreetingJointer Kotlin class. I also cannot run Kotlin unit tests using the plugin. 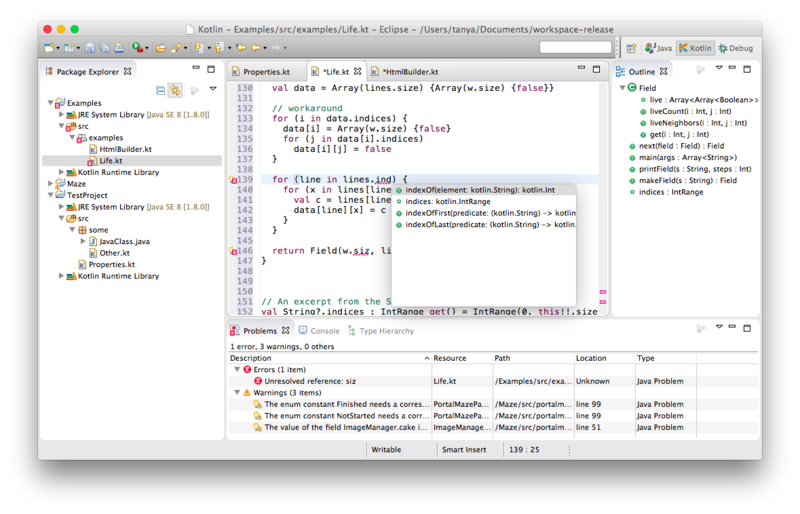 I installed the kotlin plugin in the last new release of eclipse called Photon. And I can't create Kotlin projects. When I select new project in eclipse I can see the Kotlin project options. And in the preferences I can't see a menu for Kotlin options. Unable to read repository at htttttps://dl.bintray.com/jetbrains/kotlin/eclipse-plugin/last/content.xml. but this wrong as I have a case for each branches. The only way to have the error gone is to add an else branch, but this is wrong because if I add an enum value, I will not have error (because of the else) and I could miss to write proper branch for the new value. By the way do you have some bug tracking system, where we could raised issues on the plugin ? > By the way do you have some bug tracking system, where we could raised issues on the plugin ? Could you please file an issue with your example there? When to support Kotlin 1.2 ? Re: When to support Kotlin 1.2 ? Re: Re: When to support Kotlin 1.2 ? +1 I have a Java 9 platform requirement, and apparently can't run Kotlin on Eclipse (Oxygen.2) using the current Kotlin plugin. Code works with Kotlin plugin on Java 8, crashes on 9. Last plugin update shows 3/2017 -- please update, or at least provide ETA for 1.2 support. Thanks! Is it possible to create a multi-platform project (MPP) with Eclipse Oxygen (latest release)? I cannot achieve to create a multi-platform-project as described in the Kotlin Language reference. It is possible to do that in IntelliJ IDEA 2017.3 EAP. Will MPP support be available in the future?